La Familia Bello, de Monteverde ha abierto sus puertas a los clientes de Amadeus para que disfruten y conozcan más sobre la cultura del buen café, como se siembra, se cuida y se procesa de una manera sostenible y amigable con el medio ambiente. The Costa Rica specialty, “Chorreada” is basically a corn pancake and a very tasty for breakfast, lunch, or mid afternoon snack with coffee on a rainy day. 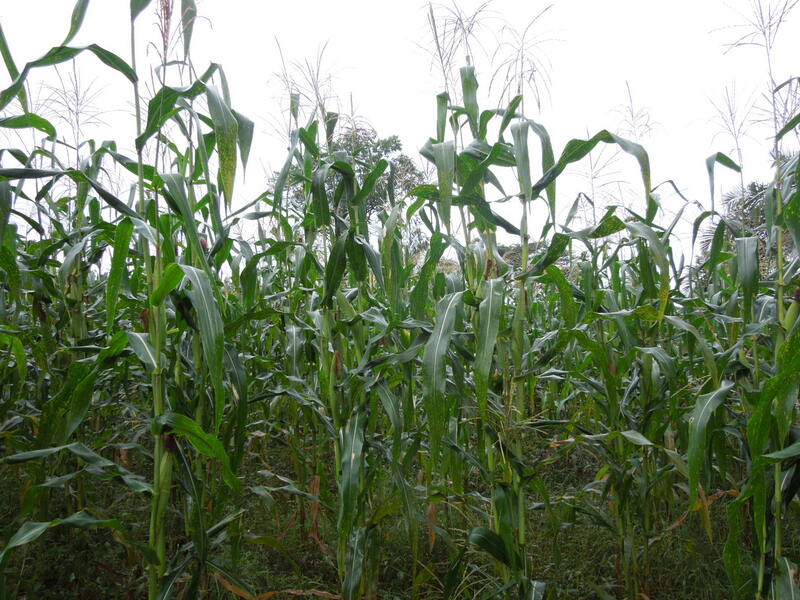 Corn is a staple in the Costa Rican diet and eaten daily by most locals in one form or another such as; tortillas, tamales, corn on the cob, and many other forms. If you are like me over 7 years ago, you probably have only seen corn in the supermarket, peeled and ready to cook. Well, now I have experience in the corn fields and picking fresh corn to eat the same day; not just buying some at a grocery store that who knows how ago it was harvested. Today we will show you how to make one of my favorite dishes; “Chorreadas” literally from scratch. Every day the teacher, Leonidas Elizondo is in two different elementary schools teaching the language of their ancestors and the culture of the Maleku to the young children in the schools. To get to the school in Tonjibe, a short foot march under the oppressive heat is required. However the neighbouring school in Magarita, one must walk four kilometres over dusty roads, sometime a motorcycle comes past and with some luck will give you a ride. In spite of the low wage and the poor situation of the schools, Leonidas is proud of his work, “One can only preserve the culture of the Maleku when we speak our language and maintain our customs.” After school a small group of young people learn the traditional dances of the Maleku. 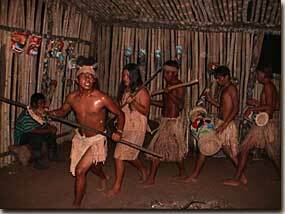 For the visitor they gladly give an insight into their culture, stories about the tribe that are performed in dance. So we meet the children in the village of Tonjibe, who play soccer and tell us of the latest children’s films on television. They meet us again in traditional dance, dressed in typical costume that deepens the stories of their ancestors, naturally in their characteristic language. With only 800 people belonging to this tribe, it is a great achievement to have maintained its independent culture and language. Leonidas is very proud of that. In a visit to the school we meet the children and experience the language and storeys of the Maleku. The variety and diversity of nature is brought up close on a walk with the domestic leader. 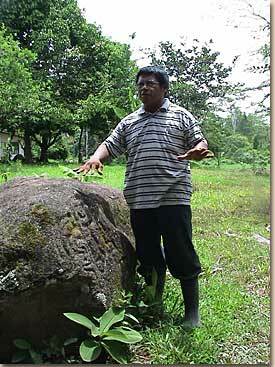 The tribe’s large wealth of knowledge, especially in the field of the medicinal plants is explained to you. How plants are used, for example in providing a local-anaesthetic, for the colouring of native fabrics and for healing a wide variety of illnesses. The fibres of a special tree are used by the Maleku in the making of their traditional costumes that are only worn at tribal ceremonies. We can also observe some of the tribal artists as they make typical musical instruments, tribal costumes and other native ornamental objects. The artistic amongst us can, under expert instruction take part. A typical lunch is served on palm tree leaves that will restore our energy levels, the tribal chief will explain the Petroglyphen (stone characters) found in the village. We can visit the Tribal Healer who also runs the Tribes radio station; here we have the opportunity to learn more about the Tribe. A performance of native tribal dances at “Village-Rancho”, the traditional meeting place of the Maleku, forms the final highlight of the day. Costa Ricans affectionately call themselves “Ticos”. I will tell you some facts that you may recognize in them! 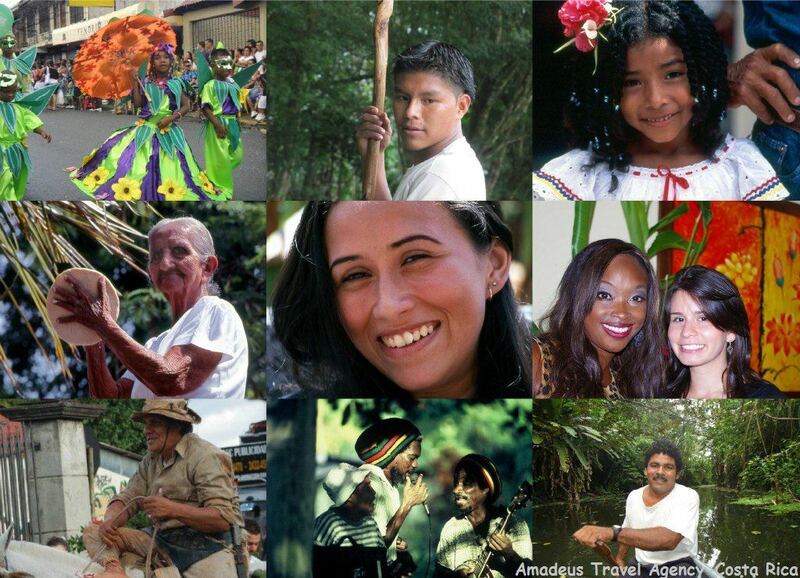 In a country with variety of cultures, you will find the ticos! They are very friendly and helpful, they are well-groomed and modern, are also extraordinary civil to one another. Their warm and friendly manner is an important aspect for many travellers who visit this country. A survey of tourists carried out by the National Tourism Institute (ICT) placed the friendliness of the “Ticos” in first place slightly ahead of the countries natural wonders. 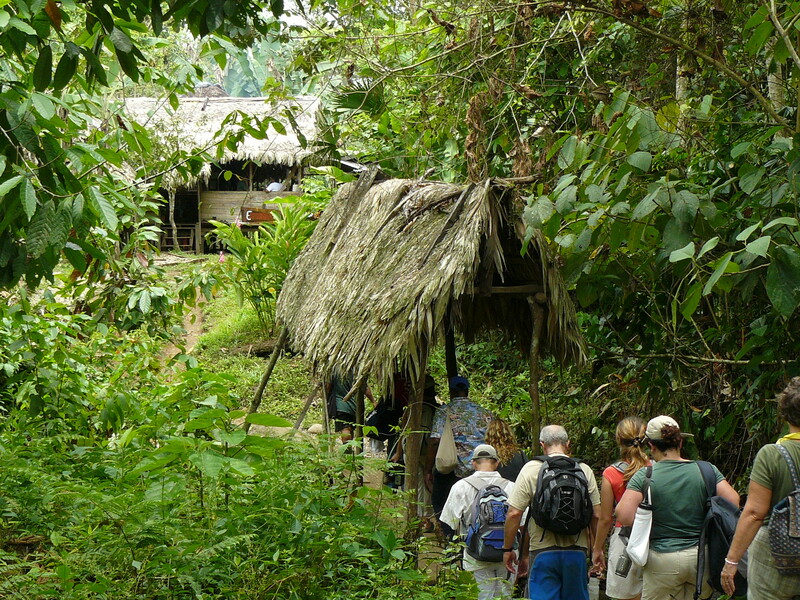 The Costa Ricans love to make contact with visitors, even if there are linguistic hurdles, with hands and feet an understanding is reached, the main thing is communication. The “Tico” is thrilled when visitors speak a few words of Spanish, and with much patience will quickly expand your Spanish vocabulary. Family life is sacred to the “Ticos”. The children are the focus, not only in families but also in restaurants, hotels, department stores, etc. In 2010 75,000 babies were born in Costa Rica. The traditional pattern of the man going to work, the woman caring for the children and household has changed in recent years, more so in the cities. The emancipation of women is clearly reflected in the various educational statistics taken from around the country. The proportion of women with Bachelor university degrees is much higher than that for men. Costa Rica has had a female president since 2010. The numerous religious festivals are widely celebrated, and the churches are well attended. The “Tico” is a proud democrat and pacifist; there has been no army in Costa Rica since 1948. One of the greatest passions is football. The 1st League plays on Sunday mornings and you meet at home or at the pub. It is not just football that is talked about, many lively exchanges take place over current events and affairs in Costa Rica. Sport is just for spectators, most “Ticos” are active sportsman. Throughout the country are the so-called “Futbol 5”; five aside football played on small football pitches that have artificial turf. Early in the morning one goes jogging or cycles. On weekends, cycling clubs nationwide meet for their bicycle tours. Around the country, you will see the very vocal lottery ticket sellers who promise great fortunes. The colourful tickets are bought with enthusiasm in the hope of winning the jackpot. The lottery is run by the government, the profits being distributed amongst social projects. There is an irrepressible urge to celebrate, no need for a special occasion – the main thing is to meet, talk, eat, drink and enjoy the happy gathering. Hello Friends, we are more than pleased to share all this nice tips with you! The following recommendations should be made in an approach to preserving our natural environment. Our advice for sustainable actions is useful, easy to implement and bring surprising results. We want to significantly participate in the realization of a fundamental and important goal: the protection of our planet. 1. Find out at the beginning of each tour of any possible measures and specific aspects of the conservation of natural resources and the environment. 2. Keep a bag in order to wrap up waste during a walk and later dispose of it properly. 3. Smoking is prohibited within national parks and biological reserves. Please note this requirement in order to avoid forest fires. 4. Avoid taking too much food on the trails of the national parks. Be sure to retain any packaging for proper disposal. 5. Avoid any unnecessary disturbance of wildlife and their habitat. Please refrain from any kind of noise while you walk through the national parks and reserves and keep your distance from the animals. Do not touch the plants, as some species are protected with thorns, needles etc. By night walks please use a weak or dimmed light source, ideally infrared light. 6. Please always remain within the marked trails and do not leave them! 7. Never feed animals in the parks or throw away any leftovers. 8. During your visits to the communities around the national parks you have the opportunity to support the residents. With the purchase of local products and souvenirs, handicrafts, cuisine, etc., they have a direct impact on local incomes – This has a positive influence on both sides, both for the community living there as well as for you as a tourist. 9. Avoid buying souvenirs and memories of your trip that are made from basic materials of endangered wild species and those that come from endangered forests. Remember that the marketing of wildlife products is illegal in Costa Rica. Please don’t make yourself liable. 10. Please try to avoid removing the plants and animals in any form from their environment. Costa Rica has heavy sanctions, such as heavy fines or even criminal imprisonment. We wish you a great trip in Costa Rica!